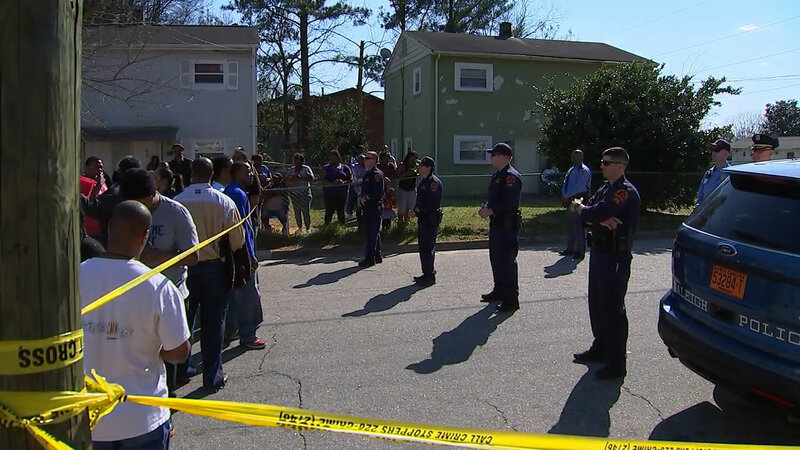 Police officers face a crowd across crime scene tape after an officer-involved shooting in southeast Raleigh. RALEIGH, NC -- A Raleigh police officer shot and killed a man wanted on felony drug charges during a foot chase Monday. "This is a sad day, and our thoughts and prayers go out to all involved," said Brown. While police have not identified the dead man, shortly after the shooting, a woman on the scene told ABC11 that officers shot her son, Akil Denkins, who was wanted on a warrant. "He was running away," said Rolanda Byrd. "They couldn't catch him so they shot at him seven times." Byrd said several people told her that her 23-year-old son was unarmed and was shot by a white officer. Raleigh's city council was supposed to hold a meeting on the use of body cameras on police officers Monday but the event was cancelled due to the shooting. Denkins was the father of two sons and turned 23 on February 8th.